Alumni and friends are invited to stop by and see what’s new at Grady on Friday, March 22, 3:30-5 p.m.in the Peyton Anderson Forum. This reception coincides with the Alumni Weekend sponsored by the UGA Alumni Association. Grady Ambassadors will be available for tours of the building. Light refreshments will be served. All alumni and their significant others, friends, family (come one, come all!) are invited for a weekend to return to campus. With hotel blocks on site and events held on campus and around town, you won’t want to miss it! Price ($150/person and $250/couple) includes four meals, activities, a reception and tickets to TEDxUGA, not to mention some awesome swag! Register by: Monday, March 4. Named after the late John Holliman Jr., Grady alumnus and former CNN reporter, the Lifetime Achievement Award honors sustained contributions to the profession throughout a career. The Henry W. Grady Award honors a mid-career graduate who has been influential in his or her field. The Dean John E. Drewry Award recognizes a graduate of the last decade who has experienced a successful early career. The Distinguished Scholar Award honors an alumnus/a for excellence and sustained contributions to scholarship in journalism and mass communication education. Chris Holcomb has been awarded multiple Emmys for his work as chief meteorologist at 11Alive WXIA/WATL, the NBC affiliate in Atlanta, where he has worked for 27 years. During this time, he has also been honored with Gabby Awards for Best Coverage and an Associated Press Award for Best Weather Reporting. While pursuing his journalism degree at Grady College, he was selected for “The Lawmakers” internship at Georgia Public Television with the opportunity to report on the 1986 session of the Georgia General Assembly. Following graduation, Holcomb worked at WMAZ-TV in Macon. Holcomb earned his AMS Seal of Approval and Certified Broadcast Meteorologist designation from the American Meteorological Society. As the recipient of the Holliman Lifetime Achievement Award, Holcomb will also be inducted into the Grady Fellowship on April 26. Henry “Hadjii” Hand is an acclaimed writer and producer with a voice for comedy. His first feature, “Somebodies,” premiered at the 2006 Sundance Film Festival and received a Golden Thumb Award from film critic Roger Ebert. Hand also wrote, executive produced and starred in the “Somebodies”television series for BET. Praised by the Associated Press as One of the Five New Shows to Watch, the show was also recognized by the LA Times Critic’s Choice as one of the highlights of 2008. Hand has also written and produced television pilots for Adult Swim, IFC, Fox Network and Disney XD. Currently, he works as a consulting producer on “Step Up,”a television series for Lionsgate/YouTube Premium. 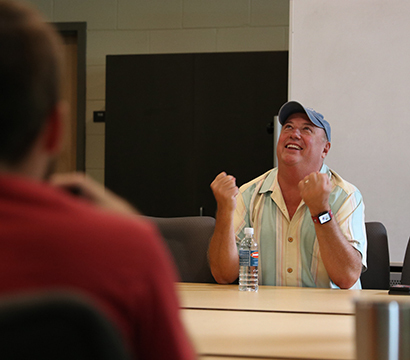 Hand serves as an instructor in the UGA’s Low-Residency Master of Fine Arts Program in Narrative Media Writing. Angela Alfano is director of corporate communications for Major League Soccer, playing an important role in sponsorship, business ventures and digital media, among other responsibilities. Before MLS, she worked in public relations at Tough Mudder in New York City, at the National Football League headquarters and in corporate communications for the Washington Redskins. Alfano started in sports communications as a student assistant in UGA’s Sports Information Department. In addition to her public relations degree from Grady College, Alfano has a bachelor’s degree in political science from UGA and a master’s degree in sports industry management from Georgetown University. She has been awarded the Chicago Skyline Award for “Establishing a New Identity for the NFL Draft” in 2016 by PRSA Chicago and was one of PR News’ “Rising Stars 30 and Under” in 2017. James “Ford” Risley is a professor of communications and associate dean for undergraduate and graduate education in the Bellisario College of Communications at Penn State University. He is the author or editor of four books, including editor of American Journalism, the scholarly journal of the American Journalism Historians Association. Before teaching mass media history and law, he was a newspaper reporter and freelance writer. In addition to his master’s degree from Grady College, he has his bachelor of arts degree from Auburn University and his Ph.D. from the University of Florida. Grady Salutes, which will also recognize the inductees into the Grady Fellowship and Sanford Circle, will begin at 6 p.m. at the Athens Cotton Press, 149 Oneta Street, Athens. Tickets for the Grady Salutes event can be purchased on the Grady Salutes ticket order webpage. Help welcome Grady students and faculty visiting D.C. for the annual PRSSA agency tour, while networking with fellow D.C. area alumni and friends. It should come as no surprise that the son of a building contractor and a junior high school art teacher, would spend time sewing and designing his own Halloween costumes at 8-years-old and molding his own Yoda masks a few years later; or, that he would grow up to work in the design playground of Walt Disney World. Eric Baker (ABJ ’90) is a creative director for Walt Disney Imagineering, responsible for storytelling and playscaping the look and feel of everything from Disney cruise ships to its newest land, “Star Wars: Galaxy’s Edge,” scheduled to open in this year. The Rossville, Georgia, native has always had a can-do attitude, which has propelled him throughout his life. “Never say ‘no.’ Say ‘yes, I can do it,’ then try to figure it out,” Baker advises about a technique he learned from his mother. 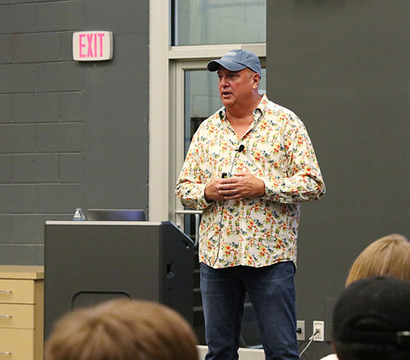 Eric Baker addressing a group of students in Studio 100 in April 2018. As a Grady College film production student and theater minor, he knocked on the door of the local cable 13 offices asking if they had a job. When they told him the only opening they had was doing make-up, he said “I can do make-up,” even though he knew little about it. “It didn’t pay much, but for me it was amazing because I had total access to the equipment,” Baker said. He worked his way up to the role of studio camera operator for the Larry Munson show and was able to use the equipment during off hours, which gave him experience to add to his resume. His first paid job in an art department came after graduation and after completing the CareerStart Program sponsored by Disney. Following the program, Baker knew he wanted to stay in Florida, which was bustling with film production. He found out that some of the production crews at Nickelodeon went out to enjoy a drink after work, so he would show up at the same bar to network with the crew. He has never been afraid to talk with people, and the next thing he knew, he was working at Nickelodeon. His resume also included Disney Channel shows like “The Mickey Mouse Club” and numerous projects with the Muppets. When Baker wasn’t working, he was tinkering. “On my own time, I built stuff,” Baker admits. “I would sit at home at night and build space ships and stuff like that.” Baker admits that he is most creative at night, sometimes waking up at 3 a.m. with his best ideas. His work with children’s television led to more mainstream entertainment, including work on “From the Earth to the Moon,” a mini-series that earned Emmy nominations for actor Tom Hanks and for the special effects team that Baker was a part of. The lure of children’s entertainment and theme parks were calling again. This time it was Universal Studios and they were building a new theme land based on the beloved Harry Potter book series. Baker spent the next two years building concept models for “The Wizarding World of Harry Potter” before becoming the decorator for each of the four parks that were building, including parks in the United States and Japan. As a decorator, he focused on props and set dressing, like the 106,000 props used in Diagon Alley. The Harry Potter parks changed the landscape of theme parks because of their totally immersive experience. But, it is the emotion and joy that families experience that brings the greatest reward to Baker. One of the most vivid experiences was the time he went to Hogwarts Castle as a spectator to watch the families enjoy the Castle just after it opened. He started focusing on two young fans who were dressed in Harry Potter robes, soaking in the experience. Eric Baker talks about his excitement when he sees families enjoying his work at the theme parks. He spoke with a group of EMST students in September 2018. Just when it seemed that the pinnacle of his career had been reached, Baker received a call from Disney, offering him a job to create a similar experience for an unknown project. For the past three years working with Disney, Baker has been creating the new Star Wars themed lands in Florida and California, a project that even has him visiting movie sets including “Solo: A Star Wars Story,” to do research. “Taking from film and creating something people can see and touch is so rewarding,” Baker explains of his work, which includes not only creating the look and feel of what people take away from the film, but also building sets and props for durability and longevity. Bulldog 100 interview: Harold Hayes Jr.
We are honoring our Grady College alumni included in the 2019 Bulldog 100. Bulldog 100 celebrates the 100 fastest growing businesses owned or operated by UGA alumni. We interviewed honorees about their experience, advice and expertise for the next generation of entrepreneurs. Harold Hayes Jr. (ABJ ’ 01) is co-founder and producer of SunnyBoy Entertainment. He is being honored with Craig Phillips (ABJ ’01), co-founder and creative director for SunnyBoy Entertainment. What is the greatest piece of advice you received from a professor or staff member while at Grady? HH: I remember professor Barry Sherman writing two words on the chalkboard that rightly changed my perspective into the endeavor ahead. The two words were: “Show Business.” That is the profession we were entering, a profession that entertains successfully only if the business portion is solidly executed. It was the first lesson of of his Entertainment Law course and one that I remember every day while being and entrepreneur in the field of content media. What is the most important skill an entrepreneur must master? HH: I believe the most important skill as an entrepreneur is to be ready to strike and seek out opportunities to make earnest connections wherever they present themselves. Some of my best connections in my career are a result of attending a non-industry event or cold calling someone I thought I’d never be able to gain a connection. Bulldog 100 honorees will be celebrated with a ceremony in Atlanta on Jan. 27. See our other Bulldog 100 profiles with Matthew Allen and Marc Gorlin. Marc Gorlin (ABJ ’95) is co-founder of Kabbage. He is also the founder and CEO of Roadie. How did your experience at Grady College help prepare you for post-college work? MG: Grady taught me how to tell a story and how to make people care. I really think Grady grads are the best at connecting with an audience, bringing an idea to light and, most importantly, making people care. If you’re raising money for things, starting a business, hiring employees or bringing in customers, you have to make sure people care. You have to connect with them on a personal level. From the very beginning at Kabbage, storytelling made a difference. It’s how we got people engaged — from our engineers to our partners to our investors. And it was from that beginning that we got enough folks caring about the vision and mission of the company that it was able to become what it is today. What does it take to be a viable entrepreneur in today’s business climate? MG: It all revolves around people, both internal and external. Inside a company, you have got to find dragon slayers. You have to find those people who believe they can achieve something impossible, especially if you’re trying to start something new. These kind of people are doers and “figure-it-out’ers.”Scrappiness is in their DNA. These are the kind of people you need inside your company, but you need them on the outside, too. , Whether you’re looking at a prospective customer or partner or investor, you have to find people who care and people who have juice within their organization to get things done.. Find people who care, find people with juice and find small projects you can work on together. How did you land your first job after Grady and how would you advise current seniors soon searching for jobs? MG: Everybody has a unique voice and path. As you’re searching for jobs, ask yourself questions like: what are you passionate about, what do you want to do and what will it take to get you there. There is nothing worse than doing something you hate. Figure out what you like to do and write it down. Create your own filter of what is important to you. When opportunities come in, you run them through that filter. For me, that meant figuring out how to be an entrepreneur from the very beginning. My dad was entrepreneur, so of course he told me early on: “Don’t get a job. Find a deal.” For me, that meant starting my own company right out of college instead of going to work at somebody else’s. MG: You’ve got to realize that perfect is the enemy of done. You have to be agile. Not only are things not going to be perfect, but sometimes they’re going to be just plain messy.But sometimes you need to get that first version done, just so you can start working on the second version and continue making it better.. Move quickly and make the best decision you can based on information you have at the time. Then, move on. It’s easier to make a wrong decision and correct course quickly rather than getting stuck in the mud trying to be perfect. The way you find the right answer is to try things and make mistakes. Then, learn and formulate the next step. See our other Bulldog 100 profiles with Matthew Allen and Harold Hayes Jr.
What do you wish you had known before graduating? What did you learn outside the classroom that could have been helpful inside the classroom? What advice do you have for current students now that you have seen the other side of graduating? Don’t let your life be governed by fear of the unknown. I have a necklace that says, “life begins at the edge of your comfort zone.” It’s true. I originally thought I was going to stay in Georgia for my first job. I had it all planned out…then I realized that I needed to step outside of my own comfort zone. There was a little nudge inside me that kept telling me to look at Montana. I made an excel spreadsheet of every local news station in the state, and I would cycle through the stations every few days to look for openings. No one in my family had ever lived in Montana. I had one friend who lived there, and he was hours away from any of the stations I was considering. My entire existing support system was on the east coast. People’s reaction to my goal ranged from disbelief to disgust to full conversations about how my choice was going to wreck my career. I was scared, but I knew I’d regret it for the rest of my life if I didn’t try. I tried. Now I’m the sole morning reporter for my station in Missoula, Montana. It’s one of the most challenging things I’ve ever done, but I know I’m exactly where I’m supposed to be. I’ve only been on air for six weeks, and I’ve already had incredible opportunities that I never would have been given in a larger market. I’ve made wonderful friends, and I don’t feel alone or isolated anymore. I get to look outside and see snow-capped mountains when I’m driving around for work, and I’m trying things I never would have done in Georgia. I’m sure I’ll look back on my life and have regrets at the end, but I’m not going to wish that I had taken a chance on myself in my 20s. I did.